Foreign Policy magazine has chosen President Moon Jae-in as one of 100 "global thinkers." 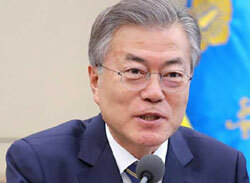 "Moon Jae-in's quiet, backroom work to forge an opening between the West and North Korea was one of the world's defining diplomatic achievements of 2018," the magazine wrote in Tuesday's edition. Moon also made it into the top 50 global thinkers chosen by the magazine last year. The magazine names "some of the most influential people in the world -– for better or worse." This year, it chose "The Top 10 of the Last 10 Years," 10 in the "40 & Under", 10 each in six categories like "Defense & Security" and "Economics and Business," 10 "Readers' Choices" and 10 "Departed," i.e., dead. Moon was one of the "Readers' Choices." North Korean leader Kim Jong-un was listed in the "40 & Under" category. "His determined pursuit of nuclear weapons and intercontinental ballistic missiles -- in the face of sanctions and diplomatic isolation -- won him a long-cherished prize: a personal meeting with a U.S. president," the magazine said. "No serious expert believes that Kim will ever give up his nuclear weapons, no matter what he promises."